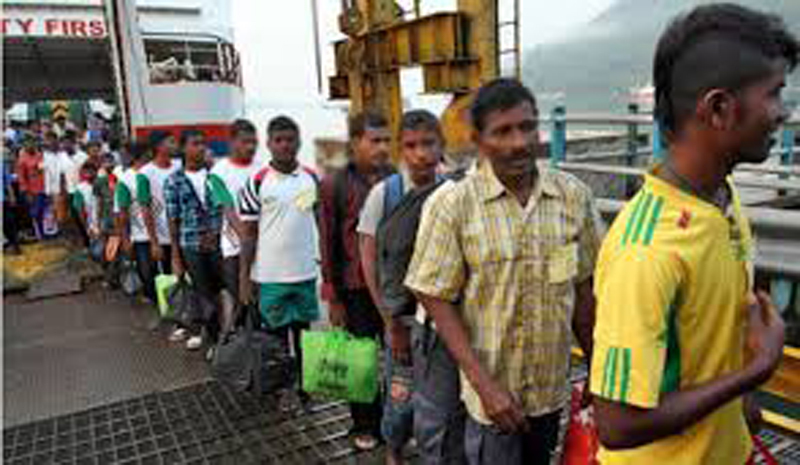 A group of 64 Sri Lankans who had boarded a fishing boat from Chilaw and had landed on Réunion Island had all been deported to Sri Lanka. They arrived in the country on board a special flight from France last afternoon. The Foreign Ministry had officially notified the Fisheries Department regarding the deportation of this group who had illegally migrated to France.The French authorities had stated that two of the group of illegal immigrants had been detained in that country for questioning. The group that was deported and arrived at the Katunayake Airport yesterday onboard a French Boeing 737 -800 around 2.55 yesterday. Among them were 54 males, six females and four children. They are residents of Jaffna, Negombo and Chilaw. The French authorities had notified the Sri Lankan authorities that the multi-day trawler “J Prashansa” carrying the group of illegal migrants from Sri Lanka had commenced its journey from the Chilaw fisheries harbour and had sailed to France’s Réunion Island. The trawler had arrived on Réunion Island after a journey of 25 days. Around 70 French officers had accompanied the group of Lankan illegal immigrants and having handed them over to the Immigration and Emigration officials, the French officers had departed around 4.30 pm. The French Embassy had facilitated the return of these migrants. They were later handed over to the CID for questioning.Meanwhile, Police arrested 21 persons who were ready to illegally travel to another country, together with three persons who were engaged in human trafficking. The 21 illegal migrants and an individual who had acted as the middleman had been arrested in an operation carried out by the STF and the Navy while they were being held at a house in the Muthukandiya second village in the Siyambalanduwa Police area last afternoon. The Police,the STF and the Navy had recovered two vehicles and Rs.627,000 in cash. The person who had acted as the mediator has been identified as 39-year-old man from Egodawatte, Chilaw. Meanwhile, the two main suspects who had prepared for this group to illegally travel to a foreign country were also arrested. They were both arrested by the STF while they were at a lodge in the Pannegamuwa area in the Tissamaharamaya Police Division. The suspects were from Dandagamuwa, Kuliyapitiya and Thalimangoda, Deltota, Kandy. The Police Spokesman said that this is a punishable offence under the Immigration and Emigration Act, while further investigations are being carried out regarding these human smuggling operations.